My favorite sleeper for Finn! New Bumbo! Finn loves it! Finn smiling at Mommy in his swing! Finn rocking his new Adidas Outfit! Finn attempting to roll from back to front! Yes, Finn's hair gets it's own post. 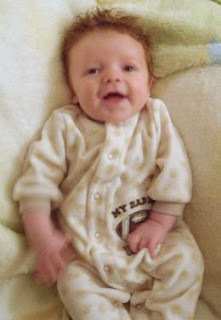 He was born with brown hair and it has beautiful reddish & blonde highlights. His hair is now growing in blonde! His hair also gets really curly after I wash it, but when it dries it's stick straight! 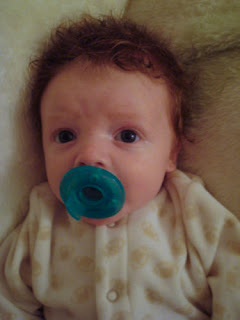 The pediatrician said the hair color & texture he has at 6 months will most likely be what he'll have for life! Only 4 months to wait!